So – who wrote this absolute stink-bomb of a book, I hear you ask? Albert Pierrepoint. And I’m absolutely allowed to be mean to him because he killed lots of people. For money. Pierrepoint, Britain’s last hangman, used a system of variable drops to snap the convict’s neck instantly – killing them as humanely as possible. I only wish he’d found a method for dispatching his sentences as painlessly. There is no ghostwriter and oh boy does it show. I’m not entirely sure there was an editor, either. In describing his childhood, every conceivable detail is named: two pages on the embarrassment and ‘indignity’ of not being allowed long trousers when he was a boy, half a page on the way his aunt took the lid off a bottle of gingerbeer. I wish I was kidding. I’d already seen the movie Pierrepoint when I spotted this book in a charity shop. 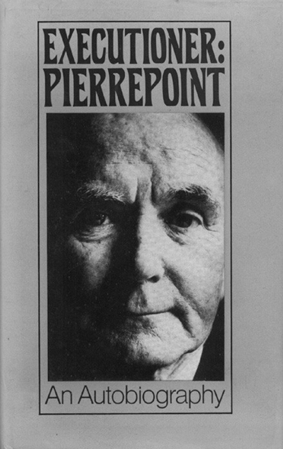 I’d read that Pierrepoint came out as an advocate against the death penalty in his later life, and that (at one point) he lived in my old neighbourhood. These two factoids were enough to get me reading – but once I was reading… oh dear. The interesting bits – i.e. his attitudes to life and death, and taking another’s life, and why the hell he was drawn to that kind of work – he seems unwilling or unable to engage with. Only that it’s about dignity, but most men don’t understand, and ladies never understand. And he is forever grateful to his wife for her ‘discretion’ in never ever mentioning the fact that he was, y’know, bumping people off for money on the side. If I were to attempt psychoanalysis I’d say that Albert Pierrepoint was a man who desperately craved the status – or in his own words the ‘dignity’ – which he perceived in adulthood and seriousness. Given that being a hangman was by definition a very serious job, and his father had been one too, I think he saw it as a way to responsibility and adulthood. I do not think Pierrepoint was a particularly perceptive or self-aware man. I don’t think he had many easily-articulated answers for why he did what he did – and therefore he was especially quick to dismiss others’ questions as their not understanding it. Well, they didn’t – and neither did he. The past is a different country. A weird, emotionally-repressed one with extremely long sentences. Posted in Blog, Book reviews, Rabid Dislike, ReviewsTagged albert, bad writing, book, death penalty, executioner, pierrepoint, reviewBookmark the permalink.